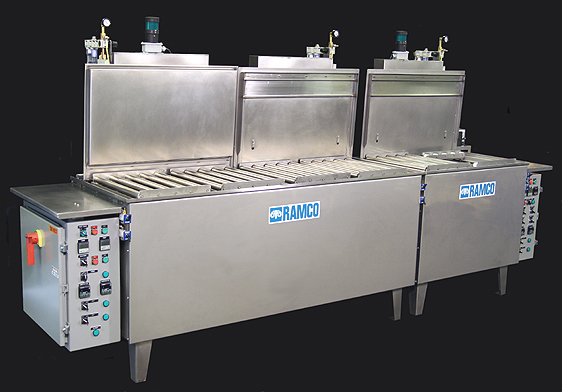 RAMCO sets the standard for modular washing systems with compact multi station consoles. 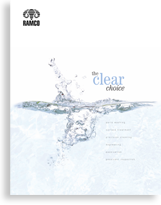 These systems provide flexible cleaning capabilities and minimize valuable floor space. Each basic system is designed to accept a broad range of auxiliary items, making it adaptable and suitable for a wide variety of applications. 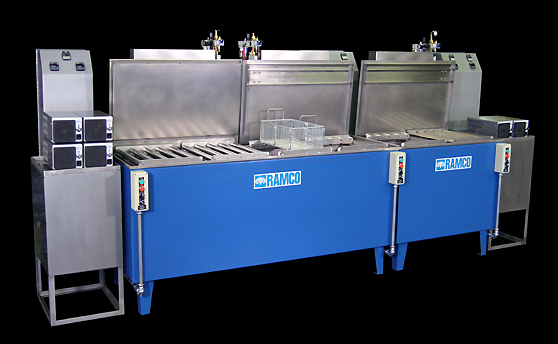 For example, the MKD24 (below top) is a wash/dry console built for removal of water soluble oils and some chips from machined components using turbulation and agitation. It includes a hot air knife dryer. 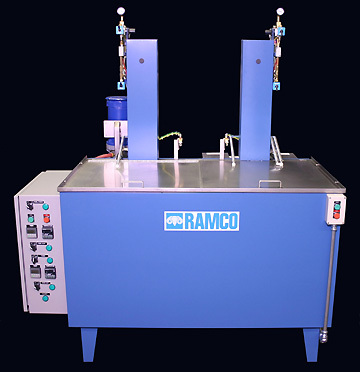 The MKD16 (below bottom) is a console built for precision washing and rinsing of electronic components using turbulation, agitation and ultrasonics for the process. In this way standard precision cleaning console systems are custom built for each process. The two stage MKD (D=Double), three stage MKT (T=Triple) and four stage MKQ (Q= Quad) are standard Migi-Kleens combined into multi stage consoles. They provide all the versatility and flexibility of single station MK units. RAM TOUGH Multi Station Consoles are a new standard. They are the first industrial strength consoles built solely for the factory floor. 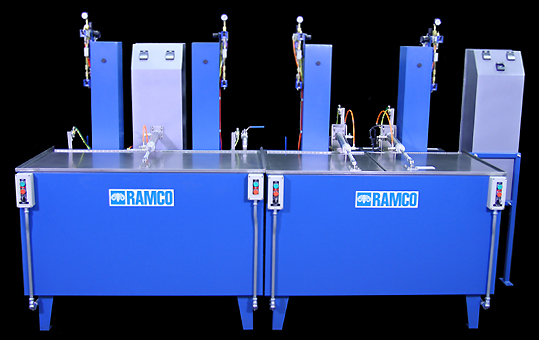 Unlike conventional consoles built for laboratory type application RAM TOUGH Multi Station Consoles are built for the rigors of production. The layout is unlike conventional consoles. Nothing is placed underneath processing tanks or tucked behind “access” panels. Piping, control valves, pumps, filter housings, pneumatic cylinders, heating elements, immersibles, generators, etc. are all located outside the console, clearly visible for inspection and access. Maintenance and service are easily accomplished. The construction is heavy gauge type 304 stainless steel with 12 gauge and 7 gauge tank walls. The elevators are also 7 gauge and double welded for added strength. A flange up solution drip lip is built around the upper lip of the console to minimize spillage onto exterior insulation walls. A rear hinged stainless steel cover is included with interior splash guard. Each station has its own pneumatic package that includes speed control, dual stroke, air filter, regulator, lubricator and safety guard. The system is rugged and easy to maintain. It automatically lowers baskets (or individual parts) into and out of the processing zone. The elevator oscillates during the processing steps (see Dynamic Flow Combinations). The speed can be adjusted for vigorous agitation (up to 240 strokes per minute) or very gentle oscillation. Each station is electrically heated and includes an indicating thermostat. Electrical panels include a 120 volt stepped-down control circuit. 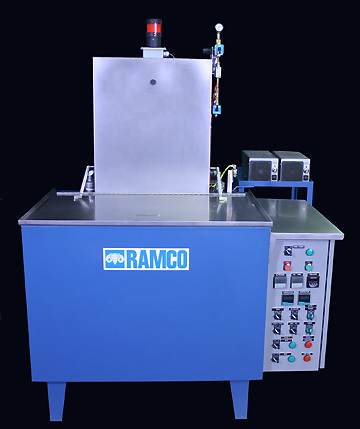 All components are rated for heavy duty industrial application. Switches and pilot lights are UL listed and Nema 4X.